Fundraising with Tupperware may seem a little old fashioned but it actually still makes a great fundraiser. Why? - Because you are working with one of the most well known and trusted homeware brands in the world. 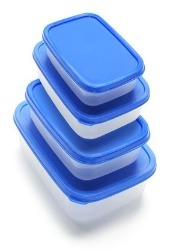 The small plastic food containers with their unique airtight seals were created by Earl Tupper over 60 years ago. Soon many other kitchen products were added to the range. 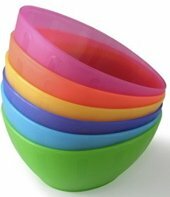 These useful products have always been incredibly popular and there are few homes that do not contain some items of Tupperware. Uniquely Tupperware built their business using a party plan model and Tupperware parties remain a mainstay of the company's business. As a part of their commitment to the communities in which they operate Tupperware Fundraising has long been part of the company story. The deal is still a good one today! The company produce a fundraising catalogue featuring around 100 items. Many of these are exclusive fundraising products. There are products and prices to suit every need and budget. They provide a full fundraising pack containing catalogues, flyers, order forms etc. The fundraiser is run over about 3 weeks and your supporters, volunteers or pupils (if it is a school fundraiser) distribute the catalogues and take orders. Your organisation will earn 40% commission of the retail price of any purchases made through the Fundraising Catalogue. With the online fundraiser your organisation is given a temporary shopping portal to The Tupperware Online Store. You encourage your supporters to shop online and receive 25% of any orders placed through your organisation. Online Tupperware Fundraisers are great if your supporters are spread out nationally or over a wide area. They are also perfect if you distribute a regular newsletter or ezine. Simply provide your web-link to the site. Online fundraising allows access to the entire Tupperware range and all sorts of web-only special deals. Your organisation will earn 25% commission on all online fundraiser purchases. These are easy to organise. You usually will work with a Tupperware sales agent who will make the arrangements for you. The advantage of this method of selling the products is that you will have sample products to hand and a knowledgeable sales person. You will also have access to the entire Tupperware catalogue. Simply invite friends and supporters to a particular venue. Your organisation will earn 25% commission on all party plan purchases. You can never have too much Tupperware! Running a Tupperware Fundraiser is a good move. The company are well known and trusted and the products genuinely useful -unlike much fundraising tat. The programme is easy to run and can provide a nice profit for your organisation. And hey - at least you'll have somewhere cool and funky for the sandwiches at next years Summer Picnics!